Heat oven to 350°F. In medium bowl, break up cookie dough; thoroughly work in flour. Work with half of dough at a time, refrigerating remaining dough until needed. On work surface sprinkled with flour, roll dough 1/4 inch thick. 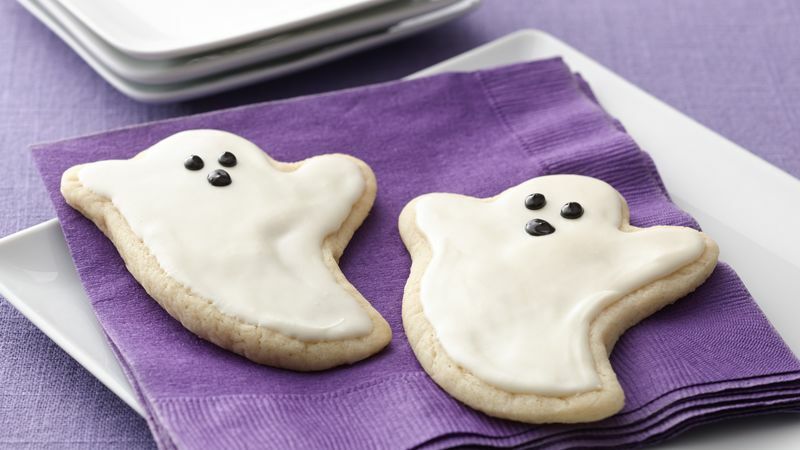 Cut with floured 2 1/2- to 3-inch ghost-shaped cookie cutter. Place 1 inch apart on ungreased cookie sheets. Repeat with remaining dough. Bake 9 to 12 minutes or until cookies are set and edges just begin to brown. Cool 1 minute; remove from cookie sheets. Cool completely, about 10 minutes. Meanwhile, in small microwavable bowl, microwave frosting uncovered on High 10 to 15 seconds or until easier to smooth onto cookie. Frost and decorate cookies with black icing as desired, using photo as a guide. Cookies can be made a day ahead and stored in a tightly covered container until ready to frost and decorate.